To a large extent, the global financial crisis of 2007-2008 was a result of excessive real estate speculation and the irresponsible management of investments and debts by the mainstream banking system. Already before the current crisis, a variety of new, responsible financial institutions were established according to ethical and sustainable principles in order to counterbalance the destructive effects of speculative finance. In this text, Christian Grauvogel explores the landscape of new financial organisations that support community initiatives and work on moving land off speculation. Over the past two decades, we could notice a major change of paradigms in the field of urban development and public services, especially in northwestern Europe. A shift took place in many countries, from the welfare state system towards neoliberal policies and practices of extensive privatisation. Many local authorities sold their real estate properties as well as infrastructure, and outsourced public services under austerity pressures. The municipality of Berlin for example, sold off big parts of its real assets, and privatised large portions of the municipal housing stock from the 1990s. Many of the real assets were sold in maximum price bidding processes without any conceptual requirements from the future owner. This caused a major rush in the local real estate market from investors who saw the potential of rather “cheap” acquisitions, and left nearly no chance for smaller initiatives and developers committed to the public good. This development could be notably seen in Berlin, but it took place in similar ways in many other European municipalities. This change led almost inevitably to the emergence of new actors in urban development. On the one hand, we can see a rise of public private partnerships (PPP), the outsourcing, and the privatisation of public services, which are taken over by private enterprises. On the other hand, we can witness a growing civic sector, as exemplified by neighbourhood initiatives and community organisations that evermore assume the responsibility of former public services. This civic sector reacts to the withdrawal of the municipalities and undertakes an increasing number of public services and social infrastructures in urban areas such as housing, green and public spaces and culture. These civic initiatives are often working without economic aspirations, on voluntary basis or under precarious conditions with small budgets and no economical backup. Over the last decade, these civic initiatives have increasingly taken over former public responsibilities and are often becoming developers of the cultural, social and ecological infrastructure. This development implicates a certain level of professionalisation with a need for strong financial partners to sustain their work. As described above, many municipalities are selling off their real assets. To prevent massive speculation mechanisms and secure long term perspectives for social, cultural and ecological infrastructure, citizen initiatives with a small initial footprint are often becoming real estate developers. The real estate is usually the essential aspect for cooperative developments, so ownership or long-term contracts are crucial. As these initiatives are not working under traditional business cases with the maximisation of profits, funding through traditional banks and funds is often not an option. As a consequence, new alliances between local cooperative development projects and “alternative” financial institutions are evolving, including ethical and cooperative banks as well as foundations. This includes ethical and cooperative banks such as the GLS Bank in Germany, the Triodos Bank in the Netherlands or the Banca Etica in Italy. These banks have a different self-perception of their societal role. Unlike traditional banks, they define the purposeful and responsible use of money for societal impact as their primary goal, as opposed to the maximisation of profits for them and their clients. As they normally invest in non-speculative markets, these banks could register a growing number of clients after the financial crisis in 2008, when their investment was more secure than those of the traditional banks and funds. To illustrate this: from 2008 to 2011, the volume of sustainable funds in Germany increased from 2,8 to 9,9 billion. This growing capital opens new investment opportunities in cooperative and self-sustaining business models. Such investments are important for cooperative and community initiatives as their business models cannot guarantee high returns, which traditional investment would require. But this also shows the weak financial situation of civic initiatives. On one hand, they are dependent on the investment of a rather small branch of the financial market, which could also develop towards a point of low investments in specific economic periods. On the other hand, smaller initiatives cannot often even access this kind of capital as they do not start with an investment-ready business case or an economic model, which complies with the investment criteria of even less profit-oriented banks. Nonetheless, cooperative initiatives have to create a certain level of return. As they are developing and maintaining social, cultural and ecological infrastructure, which often cannot secure revenue, they need to find solid economic models where more commercial activities can finance nonprofit activities. 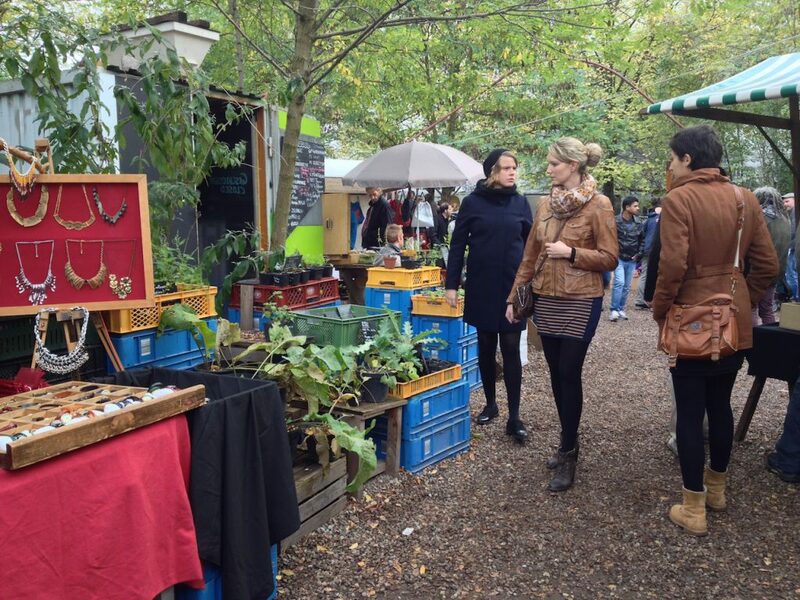 The Prinzessinnengarten in Berlin – Kreuzberg for instance, one of the first community gardens in Germany, finances its educational and community program through the profits of the garden café, horticulture contracts and workshops. However, this ongoing economisation of former public or noncommercial sectors has to also be analysed from a critical angle, since the situation of these self-financed initiatives is ambivalent. By financing their nonprofit activities through commercial activities, one could argue that such models accelerate the decline of the welfare state. Yet, these initiatives also have to finance their important elementary activities. In addition to ethical and cooperative banks, an increasing number of private foundations have become important actors in cooperative urban development. There are a few foundations in Europe that are specialised in the preservation of properties for the public good. Amongst others, the Stiftung Edith Maryon in Basel (Switzerland) and the Stiftung Trias in Hattingen (Germany) can be named. By acquiring real estate with their own capital and providing it for long-term use to tenants through special forms of leasing, these foundations are attempting to ward off the market mechanisms of land speculation. Unlike the ethical banks, these foundations are not only providing capital for cooperative initiatives, but are rather functioning as long term project partners for these initiatives. By investing in (self-) sustainable and cooperative community initiatives, these foundations become one of the most important actors in cooperative area development in Europe, even though their financial capacities are still rather small compared to ethical banks. The Stiftung Edith Maryon, for instance, invested in several initiatives in Berlin such as the ExRotaprint, and recently bought the Kindl beer brewery area, which will be developed in the upcoming years as a cultural and social neighbourhood. Although this sounds like a great model, which serves the communities’ needs very well, it also has its downsides. With the growing importance and responsibility these foundations gain, they also become a powerful, but not democratically legitimised actor in urban development. The selection of projects for funding and realisation is no longer carried out by elected governments or local authorities, but by private foundations. This does not necessarily result in worse decisions and circumstances, in fact, many community organisations would probably claim that the opposite is the case. But it certainly shows the need for new governing and policy models in an era of community based urban development. 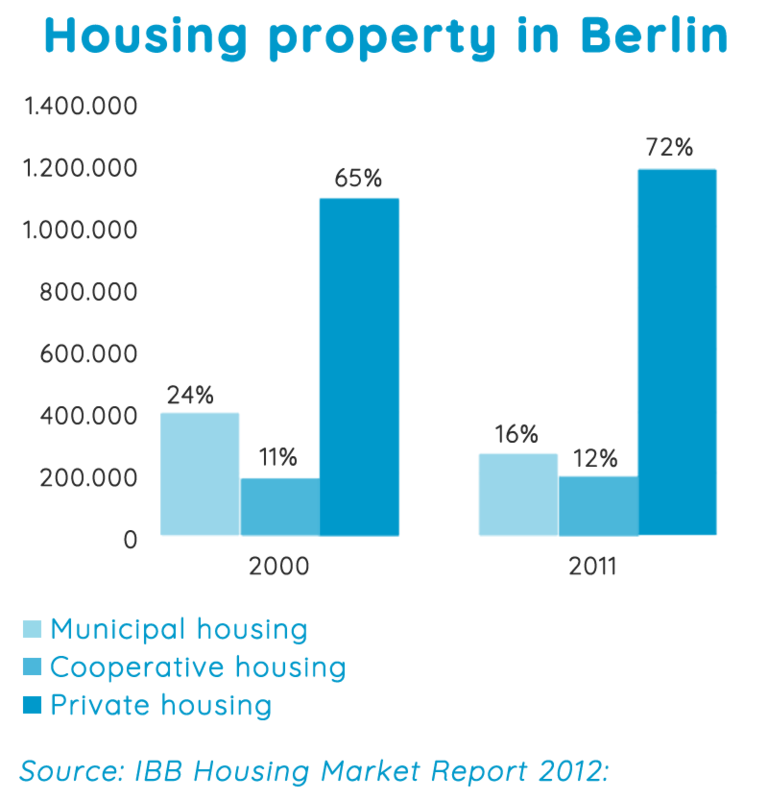 One example is the intended change of the real estate policy in Berlin from a maximum price bidding procedure to a concept-based, transparent privatisation policy for municipal owned real estates. As a consequence of a growing amount of political pressure from various civic initiatives, the local government began a process for the reframing of the real estate policy. In 2013, concrete demands were published by an alliance of civic initiatives for a change in the real estate policy, initiated by the Initiative StadtNeuDenken. One year later, the federal state government of Berlin enacted the concept for the new transparent real estate policy. By focusing on the concept and not just on the highest price, the municipality seeks to consider cooperative initiatives focused on the public good, while still maintaining a certain level of control over the development processes in the city. The real estates are no longer just sold for the highest price with fiscal goals, but long term development perspectives are also taken into account. In fact, this pilot project is still being developed, and there currently are not many cases that can provide evidence on the real impact of this concept-based privatisation. Many civic initiatives claim that many of their demands were not included, and that this new real estate policy is not an effective tool against real estate speculation. Moreover, there is still no transparent participation of the civil society in allocation processes. This discussion of two important financial actors in urban development has sketched the difficulties of accessing capital for cooperative and community based initiatives. Even though there are an increasing number of alternative funding opportunities through ethical banks and foundations, they have limited financial capacities that cannot last to offer the capacity necessary to serve the expected increasing amount of cooperative developers in the future. Furthermore, these funding options still pose high thresholds for small-scale initiatives. Thus, there is a vast need for additional funding opportunities. While still facing big difficulties in accessing capital on the one hand, the current situation offers several opportunities to realise such new funding instruments for cooperative initiatives on the other hand. 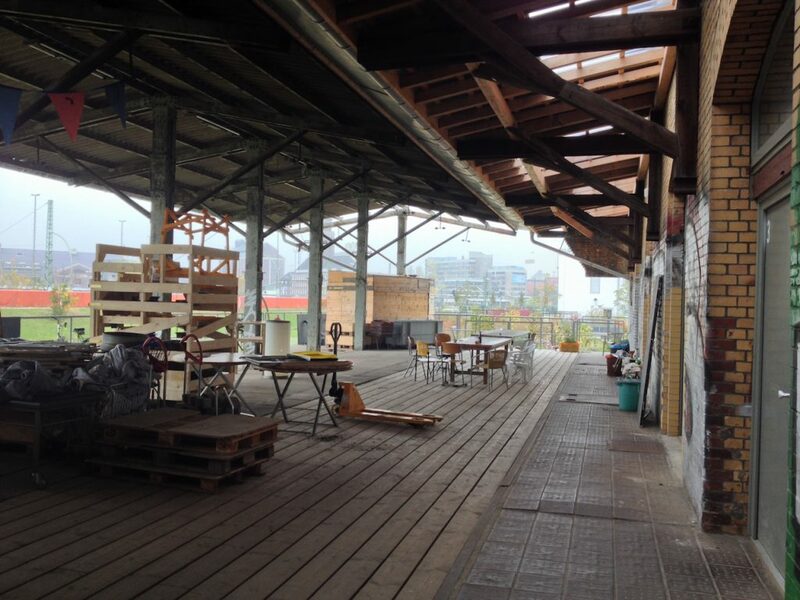 Community-led urban development has never attracted more attention in Europe than nowadays. Many local and national governments acknowledge the important role of civil society in the development of cities. 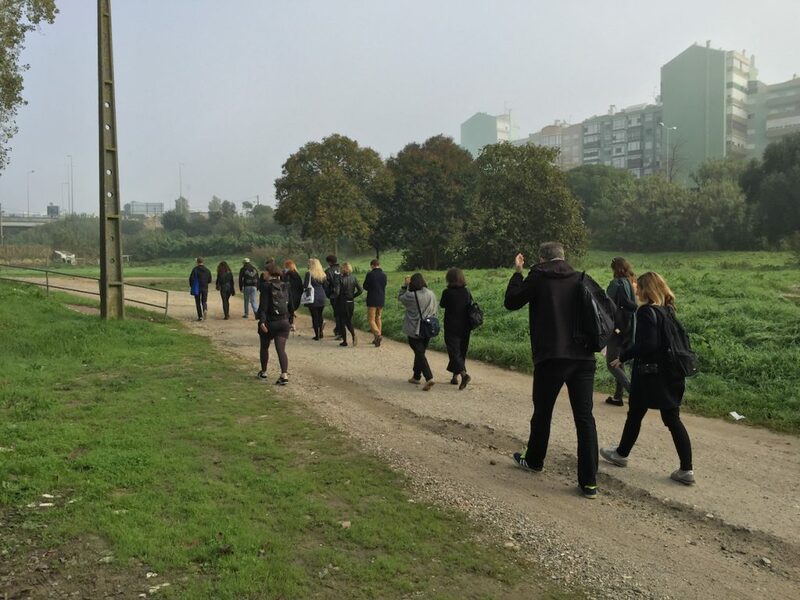 In addition, there is a constantly growing and professionalising European network of civic initiatives enrolled in urban transformation processes. In the international re:Kreators Network, the idea of a European cooperative fund is developed. All of the cooperative initiatives create different types of values, but oftentimes, they are not able to monitor or quantify these values. As a result, financial institutions often still hesitate to fund this relatively new civic sector, as they cannot prove their economic reliability. By combining the created values and developing a joint “portfolio” of community-based enterprises, it would be possible to attract new social capital. Existing comparable and successful “business” models could prove the financial liability of cooperative economic business and ownership models. This “portfolio” could guarantee a higher investment security for financial institutions as well as capture the value for the initiatives. In contrast to single initiatives negotiating with financial partners, a cooperative model would strengthen their position. By developing return mechanisms for the created monetary values, the fund could enable other development projects and prevent cash out mechanisms that occur with traditional investments. In a long term perspective, parts of the return could flow back into the fund and facilitate new initiatives rather than financing financial institutions. In contrast to the mentioned foundations, the control over the capital would remain with those who produced it in a cooperative model. 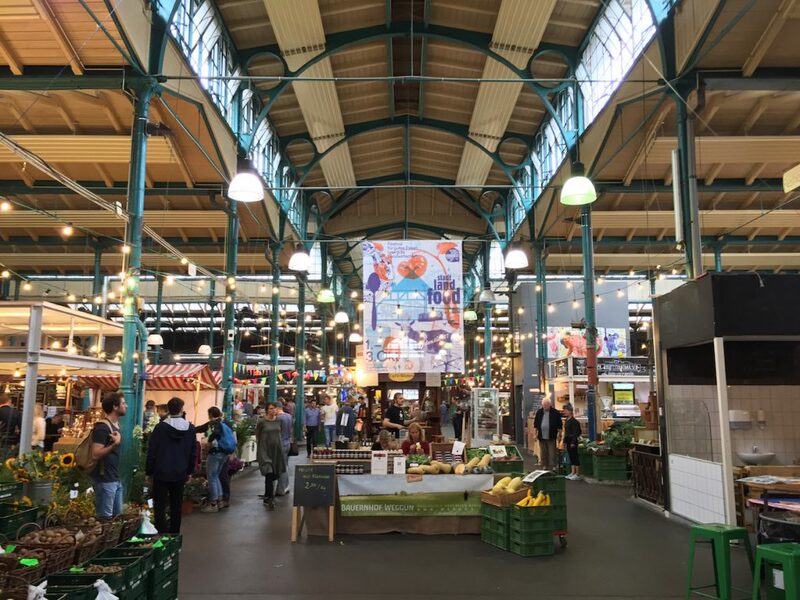 Through a European approach it would be possible to multiply the model of social, cooperative investment and still maintain a local level of trust which is essential for these kind of cooperative models. This fund could be compared to the German Mietshäuser Syndikat, a trust of independent tenements in which existing housing initiatives support the foundation of new initiatives through a solidarity tax on their rent. An international fund for cooperative area development could work in a similar way. Through this mechanism, each organisation that was supported by the fund is still independent, but supports the trust following a first phase of stabilisation with a solidarity tax. By multiplying this on a European level, projects and initiatives not located in northwestern Europe and do not have access to the social capital in this region would also be able to succeed with their project and profit from existing social capital. Through a growing solidarity capital with each new supported project, this fund could enable ever more similar initiatives. This model of course also poses several questions about the governance and regulation structure. Similar to foundations this way of financing also lacks any democratic legitimisation, but unlike traditional foundations, a cooperative fund would be self controlled and not depended on external financial institutions and their decisions, so the projects would be funded by themselves. Furthermore this kind of funding model needs strong regulations to prevent speculation and cash-out mechanisms. Also attracting the first social capital for initial investments without attracting traditional capital with high return expectations seems difficult. 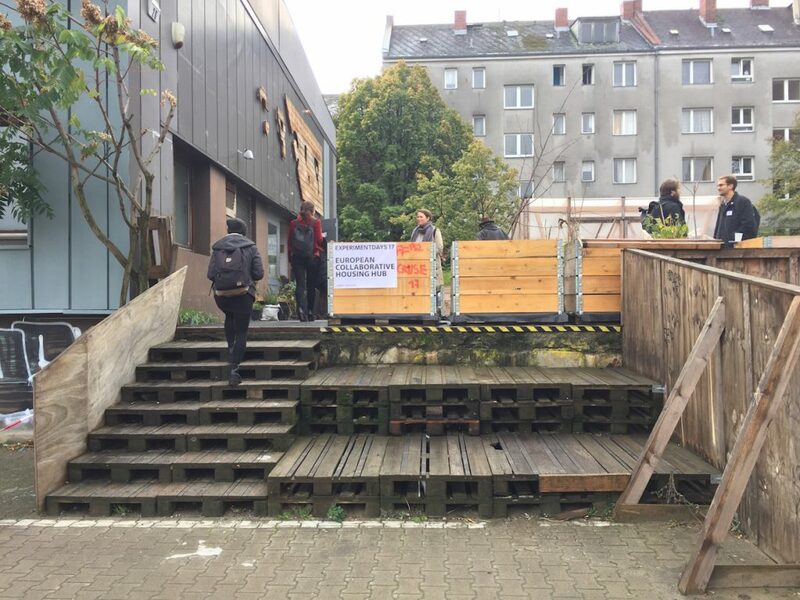 These challenges notwithstanding, it could be a possible answer to the rising demand for alternative funding for cooperative urban development, and is worth further research. 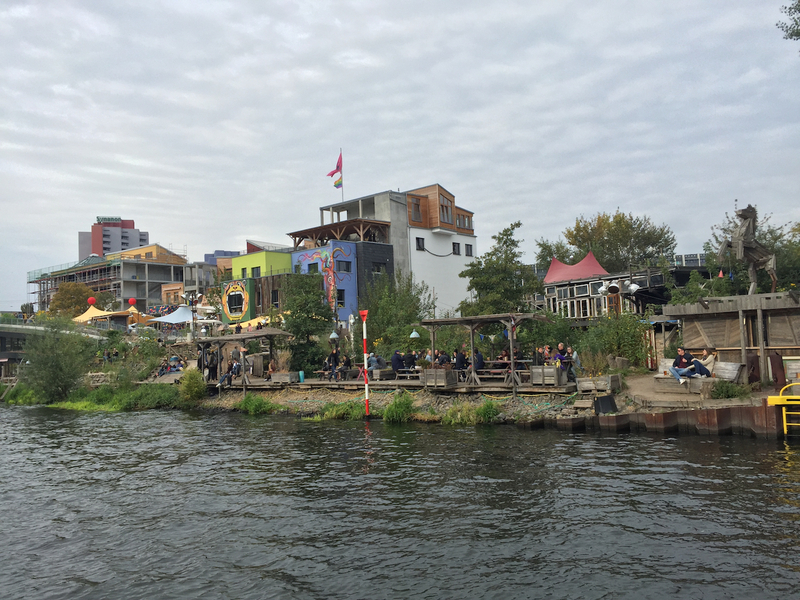 Berlin, Economy , article, civic space, co-working, commons, community, cooperative, crowdfunding, English, ethical bank, finance, foundations, Funding the Cooperative City, green spaces, heritage, ownership, public spaces, renovation, social inclusion, work.